Some amazing news came out relatively recently: Chicago had a week without a fatal shooting. Chicago passed a milestone Sunday morning [March 5] when a full week went by without a fatal shooting. The city has not gone seven days without a fatal shooting since Homicide Watch Chicago began keeping records in January 2013. The last fatal shooting happened at 10:48 a.m. Feb. 26 in the North Lawndale neighborhood on the West Side. Since then, 33 people have been shot in Chicago, but none fatally, according to Sun-Times records. Eleven of the 33 victims were in serious or critical condition. So far in 2017, there have been 101 homicides in Chicago, according to Sun-Times records. Ninety-six of those 101 victims were shot to death, including two killed by Chicago Police. Four people have been fatally stabbed, and 2-month-old Aliya Acosta died of child abuse. I go to Hey Jackass! for all my Chicago shooting stats needs (at least going back to 2012.) There’s also homicide stats, not necessarily from shooting. But far and away most homicides in Chicago are via shooting. I see the author of Hey Jackass! has added some helpful icons, such as the snow from 3/13-3/15. It was fairly cold, too, though that doesn’t look all that cold for Chicago. I guess shooting tends to be a more extracurricular activity, as opposed to being among people living together. On Friday/Saturday, there was some warmer weather, and we can see the shooting popping up just fine. The Brennan Center projected 727 murders in Chicago in 2016, an increase of 47% over 2015. In reality, the number of homicides was 762, the highest number in two decades. The reasons for Chicago’s high murder rate aren’t clear, but a combination of a small number of repeat offenders, a decrease in the number of police detectives, and severe poverty and unemployment in a handful of neighborhoods might be behind the increase, the report’s authors speculated. The more than 200 additional murders in Chicago in 2016 compared to 2015 were enough to push up the murder rate across large U.S. cities. “The ‘national’ increase in murders identified by this report … may owe more to profound local problems in a few Chicago neighborhoods than national trends,” the authors wrote. Well, perhaps. Below I will look at the disparate impact of murders. But let’s look at those “most dangerous cities”. So… 860.6 per 100K vs. 1157.6 per 100K. What’s the population of Chicago vs. Charlotte? The reason Charlotte was #2 was because the rate increased by 23%. That means that Charlotte increased from 700 per 100K to 860 per 100K. So about 5600 violent crimes up to 6880 violent crimes. Yes, that’s quite an increase. But the rate is still below that of Chicago. Similarly, San Antonio, Texas made the list at #1 because of a really large increase in violent crime rates, but the overall rate is lower than even that of Charlotte. Those are it. Saying that cities are most dangerous due to an increase in crime rates is silly. I would rank by their crime rates, period. Let’s be blunt here. The murders aren’t evenly distributed. It’s mainly black men deliberately killing other black men in specific areas of the city. Almost 80% of murder victims in Chicago are black. About 32% of the population of Chicago is black. Here’s the 2016 map from Hey Jackass. 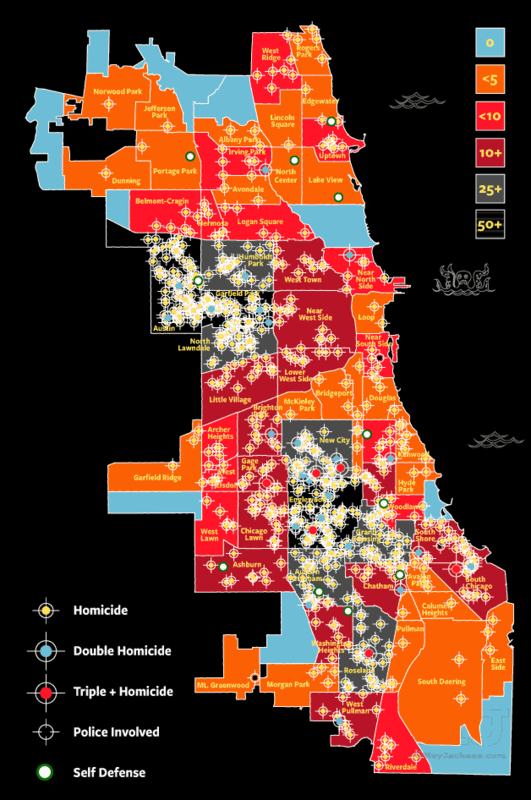 In both, the worst three neighborhoods for murders are: Austin, Englewood, and Garfield Park. WHAT KILLS PEOPLE IN CHICAGO? That’s what kills most people in all of the U.S., and it’s true in Chicago as well. Here’s a handy data set from the City of Chicago data portal. Unfortunately, it only covers 2006-2010, and 2010 was a year for record lows in murders. Also, the data set is far from complete or unique. Ugh. They have cancer (all sites) and colorectal cancer? Obviously one is a subset of the other. Yes, heart disease and cancer are the top two, though. Not all homicides are firearm-related (nor are all suicides) but COME ON! Give me some exclusive death causes so I can compare! Heck, I can’t even get the total number of deaths to total to their full Chicago entry. Do you even audit your death data, bro? The overall rate for Chicago: 2.3% of deaths were due to homicides. Contrast that to 23% of deaths being due to cancer and 17% of deaths being due to heart disease. Heck, accidental deaths were 4% of the deaths, more than homicides. I’m not saying that homicides in Chicago are unimportant as a problem, by the way — I think many people can see why it’s a problem, especially since while murders were 2.3% of deaths in Chicago in 2006-2010 (when homicides were at historical lows for Chicago), in 2010, there were about 13,000 people who died of homicide compared to 2.5 million who died in 2010. That’s 0.52% of deaths. There was a disproportionate amount of homicides in Chicago, even before their recent increase. But it should make those who jabber about terrorism being an insignificant cause of death in the U.S. — homicide as a whole category is an insignificant cause of death as well, but it is seen as a serious problem. And it is. Chicago isn’t even the worst on this score — it’s just the largest city with this as a really bad problem.